We’re making Valentine’s Day cards this year. 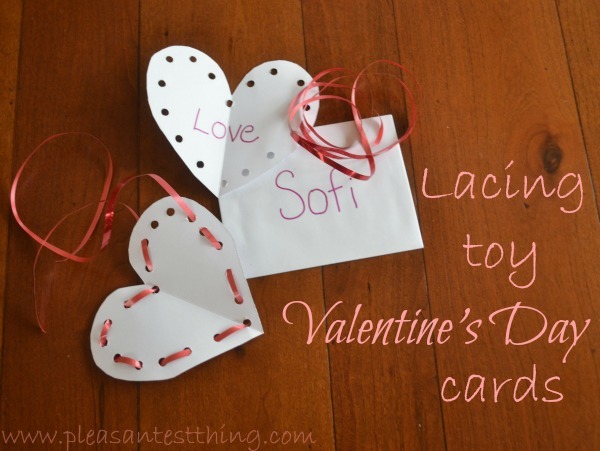 We decided to give a Valentine’s Day twist to the Christmas themed lacing toys we made last month. I had blank card and envelopes that I picked up at a craft store. However, if you don’t have blank cards, you could just cut out white construction paper to whatever size you wanted. I folded the card, and cut a heart out along the fold. 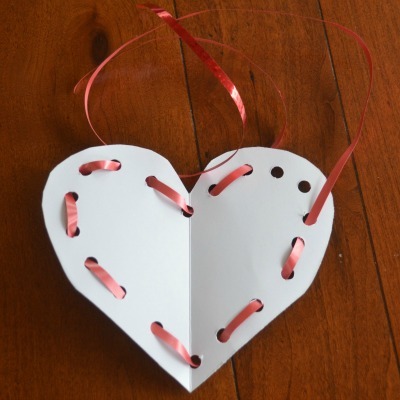 Then I opened the card out and punched holes along the edge of the outside of the heart, making sure to keep the hole in the hole punch away from the edge of the paper. Using a red Sharpie marker, I added messages to some of the hearts like “love” or “be mine” or drew lots of little hearts. Your child could do this as well, or your could have your child trace the words, or draw or decorate the hearts some other way. My preschooler wasn’t interested in writing the words, but my toddler wanted to paint the cards! Then I cut a length of left over red Christmas ribbon to use to lace the heart. We filled the envelopes with the heart and the string. And then decided who we would surprise with the cards!